Diamonds for Dessert: A Paris! Hi everyone! Just wanted to let you all know that I'm here studying abroad in Paris for all of July, so I apologize in advance for being slow at updating, if I do at all this month, especially with my lack of an oven here. By the way, do any of you have any suggestions for things that I must see/do/eat/buy in Paris? Any tips? Comments on such would be greatly appreciated :). Oh, and Happy (early) 4th of July! Gnomes always make me think of traveling, in part due to those Travelocity commercials with the gnome in the hotels, but for the most part, due to Le fabuleux destin d'Amélie Poulain , those polaroids of her dad's gnome abroad. Since I'm traveling in Paris, I thought gnome cookies and another Amélie reference would be appropriate. 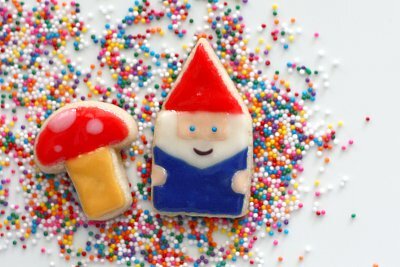 If the photo above looks familiar, it's because I saved it from Easter, when I also made a couple of gnome and mushroom cookies (because gnomes always seem to be associated with mushrooms). Enjoy! To ice the cookies, make the sugar cookie icing. Keep a little of the white icing off to the side. Tint half of the remaining icing red and the other half yellow-orange. First fill in the vertical rectangle with the yellow icing. Wait for it to dry. Then fill in the rounded top with red icing. Wait for it to dry. Take a toothpick and dot white icing on the red and slowly spread it out to form round dots of different sizes. To ice the gnome cookies, make the sugar cookie icing. Tint 1/3 of the icing red. Tint another 1/3 of the icing blue. Finally with the last 1/3 of the icing, keep 1/2 of it white for the beard. Tint the other half of the last third of icing a peach skin tone with a tiny bit of yellow, orange, and pink food coloring. 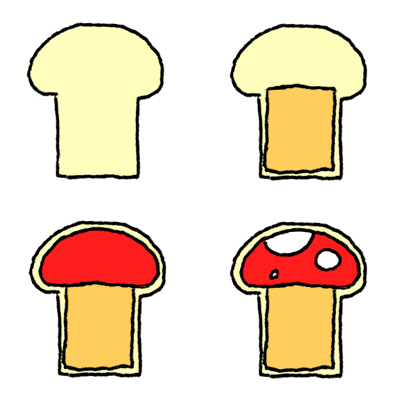 After coloring all the icing, fill in that top triangle with red icing to make the hat. Wait to dry. 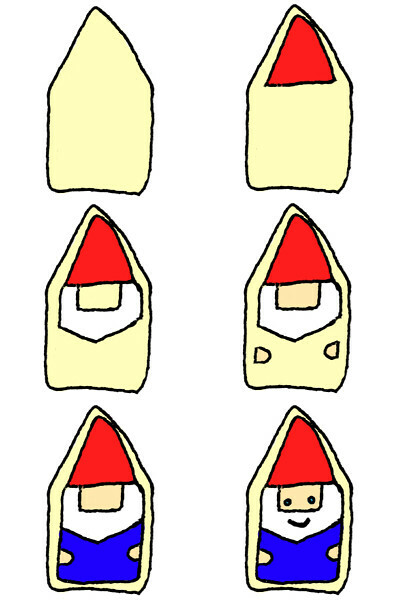 Next, use the white icing to make a beard, leaving a blank rectangle under the red hat for the face. Let the icing totally dry. Use the peach icing to fill in the empty rectangle and make little semicircles for the hands. Let the peach dry. Fill in the rest of the space with the blue icing. Place the blue nonpareils in the peach face rectangle for eyes. Lastly, place the black icing in a plastic bag, cut off a tip and pipe mouths onto the cookies. Salut Susan! First, I just want to say I love your blog and am so glad I stumbled upon it a few weeks ago. 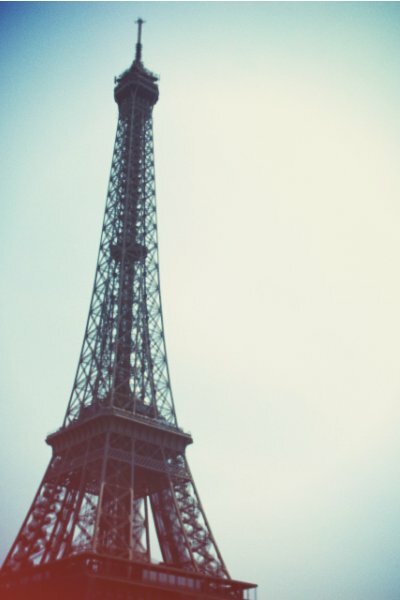 Second, I AM SO JEALOUS YOU ARE IN PARIS! I returned about a month ago from my own semester abroad...I was studying at Sciences Po off of Blvd Saint Germain for five months. Anyhoo...advice! You MUST sit on the steps of Sacré Coeur at sunset with a bottle of wine and some good company...it is the BEST, and so many students & locals do it. As far as wine is concerned, try some Cahors; it's from the South Western region in France, and it's generally a dry wine with a caramel finish...delicious! Definitely check out Shakespeare & Company, right by Notre Dame...it's an AMAZING English book store where Hemingway (among others) used to write, and they have an upstairs with an old-fashioned typewriter, a beautiful piano, and comfy places to sit and read. Berthillion on Ile Saint Louis has the best ice cream in Paris. La Parisienne Boulangerie (RIGHT outside the Cardinal Lemoine Metro stop, line 10) had the 2nd best baguette in Paris, but it was my personal favorite...try getting one fresh out of the oven! There's a little pâtisserie at 52, rue du Bac called Milcent...try the café macaron, it's out of this world. If you're craving some falafel, check out L'As du Falafel in the Marais, and definitely get the special sauce on top! And I'm not sure how long you'll be in Paris, but if you get a little homesick and need a taste of America, head over to Breakfast in America either in the Marais or on rue des Écoles...it's an American style diner (started by an American) they have amazing burgers, fries, pancakes & milkshakes, just enough to get a little fix of home. Whew, okay, I just wrote a book, but if you have any more questions or want more recommendations, just send me an email (kmkearsey@gmail.com)! Bonne journée! so beautiful! thanks for posting! Katie: Salut Katie! Merci beaucoup pour "le roman" (hehe) je l'adore. So many good tips. I'm going to attempt everything on it! Tried two things on the list recently: Shakespeare & Co and Berthillon ice cream; both were awesome. Dropped by L'As du Falafel but they were closed; will be trying again next week. Thanks again for the wonderful comment! Lisa & Anne: Thank you :D! Lizzy: Thanks for the recommendation! I dropped by Café des 2 Moulins on Saturday, definitely something a huge Amelie fan like me just had to do. Too bad it started raining right after we got there so I didn't get a chance to go to Sacre Coeur. That's alright though; it means I just have to go back to Montmartre :). ZarpandiT: Thank you! Yeah, Amelie is seriously awesome. Bora: Definitely, in my mind gnomes = Amelie. Thanks, I'm having a blast in Paris. 2) Le crêp'uscule; 91, Rue Lamarck. This is really a hole in the wall creperie. Les crêpes flambés sont très très forts!!! Also there's a really neat little book store along this road near the creperie. Can't recall the name, but you'll probably walk right past it! I recently started a food blog with a friend if you care to check it out. Hey there! 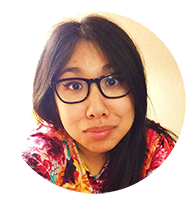 I've been reading your blog for a little while now (actually recently made your SSB cookies for a video game party with a bunch of guys who thought they were the coolest things ever), and it's so exciting to hear that you're in Paris! I spent 2 and 1/2 months in France this past spring and loved every second of it. One restaurant you should definitely try is the Crêperie Bretonne Fleurie. It's at 67 Rue de Charonne, just down one of the side streets from the Bastille. The chef is actually from Brittany and cooks really traditional dinner crepes...and dessert crepes! It's so good. One of my all-time favorite things to do was just hit up one of the little stands near Notre Dame, buy a warm panini, and just sit and eat it in the park behind Notre Dame...it's such a gorgeous place. I was there in spring when everything was flowering...there's this beautiful little spot lined with purple trees (I think they're called prunius trees?) and the little blossoms scatter all over the ground. Hope you're enjoying your time there! I told my family that for my 30th birthday I was going to have the Travelocity gnome tattooed above my bottom. Their collective horror made me feel better about that milestone. Totally unrelated to your post I know, but I couldn't resist. Hope you're having fun in Paris! Paris? Jealous! I immediately thought "Travelocity Gnome" when I saw your picture! stumbled across your blog on google. I AM IN LOVE! you have the cutest creations and ideas! Ashley: Haha, gnomes and mushrooms are definitely appropriate for any occasion! Thank you so much for the suggestions. I went to eat crepes at Le crepuscule with some friends. They were so good! And bonus points for the pun in the name. Catherine: Thanks for sharing about the SSB cookies. Haha, guys do seem to like them. Thanks also for the suggestions for Paris. The park by Notre Dame was adorable and definitely a good place to take a break after all that walking. Ms. Humble: Haha, that would be quite an interesting tattoo to have. kitchen koala: Yeah, when I see gnomes that Travelocity commercial often seem to pop into my mind. What effective advertisements, hehe. Jeri: Thanks! I'm glad you're enjoying the blog! Great cookies! Where do you buy the blue food colouring? Anonymous: I bought my food coloring off Amazon. I prefer using a paste food coloring because I can use less of it and it still shows up well due its more concentrated form. But if you don't like buying things online or need it sooner, liquid blue food coloring can usually be found at supermarket in the baking aisle. 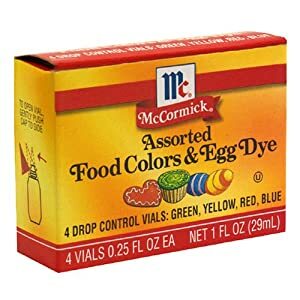 I usually see McCormick's four color assortment of food dye with red, yellow, green, and blue. Beautiful! I wish me had all those decorations in Italy to make these lovely creations of yours!! ElleJay: I'm so glad you like them! Hilary: Sorry for such a late response! I think it might have to do with the brand of food dye that you use; some brands do have more pink-ish reds. I use Ateco brand coloring and I find that it is pretty red. Maybe adding a little bit of yellow would help, because I'm thinking that orange also has red so that might not help balance out the pinkness.